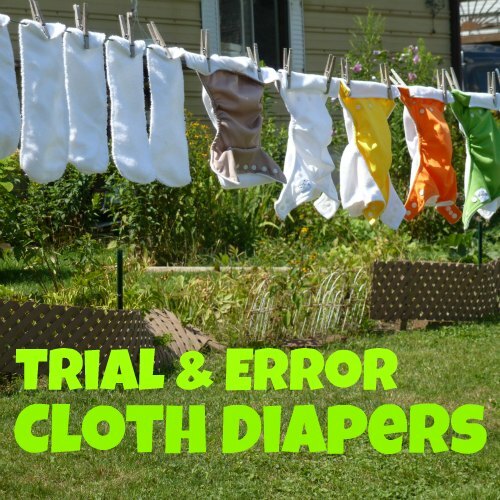 My son’s childcare center agreed to use cloth diapers if I took the dirty ones home every day. More details under “What about childcare?” in this article. Have you shown the staff the exact type of cloth diaper you use? They may be picturing something with pins or much harder to use than disposables, whereas those diapers you have look easy! I tried to show them one I had in the diaper bag, but we were filling out paperwork and the women just shrugged it off. I will keep working at them 🙂 Of course I would take the dirty ones home every day!! I’m going in there this week and I’m going to ask again WHY they don’t accept them. If I knew their reason, I would be more accepting. When I asked our daycare about it they stated it is for ‘hygienic’ reasons that they are not allowed. Something about having a dirty diaper sitting in a wet bag in a box or something, IDK. I use them!! She is just a little too skinny for them now so we have to overlap the tabs and the sides fall down sometimes. And she pees too much for just one insert 🙂 But I never said I don’t use them!! They work really well with one Kawaii insert in them. She slept in an orange one last night with no leaks!! I don’t use the GroVia insert anymore because it doesn’t absorb her EBF poop… but I use the GroVia cover as a waterproof cover over prefolds. That’s the only one I don’t really use anymore. We are immensely thankful for the diapers you gave us!!! If you are having problems with leaking at night, try using a wool cover. I used Aristocrats with our son at night and he was always dry the next morning, even after 10 hours! So far the new inserts seem to hold more. We’ll try that if we have any more trouble. Thanks!! We had the same issues with the e-bay diapers. I use bumgenius inserts in mine and they work perfectly! I ❤ cloth as well!